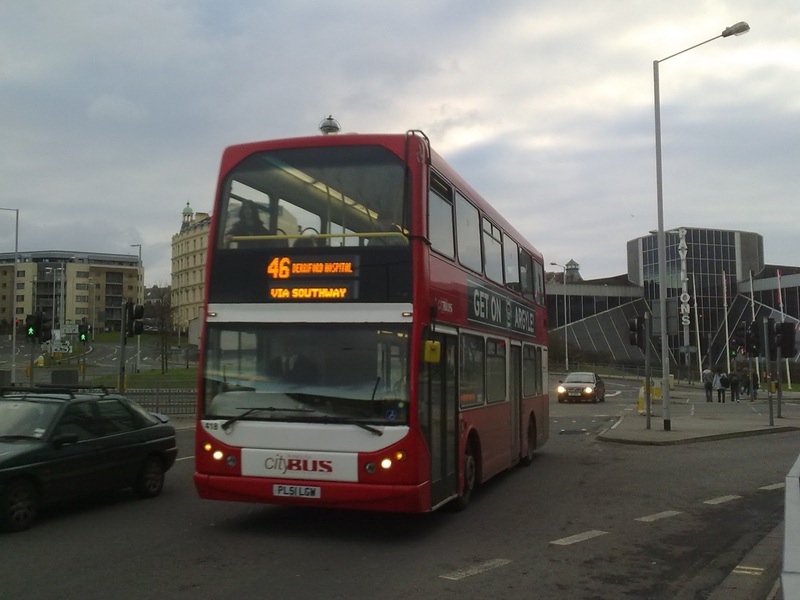 Plymouth Citybus' Volvo B7s from London have been nearly solely used on the 26 since arrival, in competition with First on the 3. They have now also been moved onto operation on the 36 and 41A since the route was changed. The deckers did seem to have excessive capacity though, which the 26 often didn't need. This week there seems to have been a workings change, with Citaros that would normally be on the 43, appearing on the 26, along with Darts. 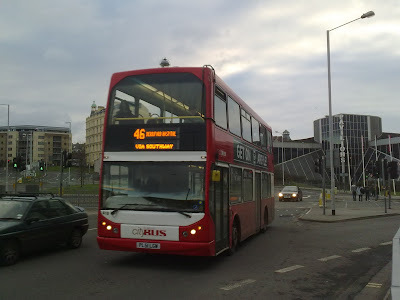 The B7s are being used on the 43 as well as other routes on a trial basis. Amazingly as one of the photos shows, one was operating on the 46 today, normally used to step entrance Darts!! This does seem a pretty good decision. The 43 often struggles with overloading, with a lot of people packed into the Citaros! The deckers seem perfect for the route and I'm sure the users will be very pleased to keep them. Though the total capacity isn't actually vastly different (because of extra standing room on a Citaro) the B7s will provide a much more pleasant journey when the numbers do rise! Certainly a very good bit of planning from PCB if this continues. In my living memory, I can't actually think of a time I have seen a decker operating on the 25. Of course deckers at one time would have been common on the Hoe, but of course, without the roof! This Volvo B7, PL51 LGW, was seen operating the service last Saturday, reviving the double deck operation. If only the old sight seeing open top tours could be brought back. With thanks to one of my regular contributors I can bring you back to around 2005/6, years of large change at the depot. 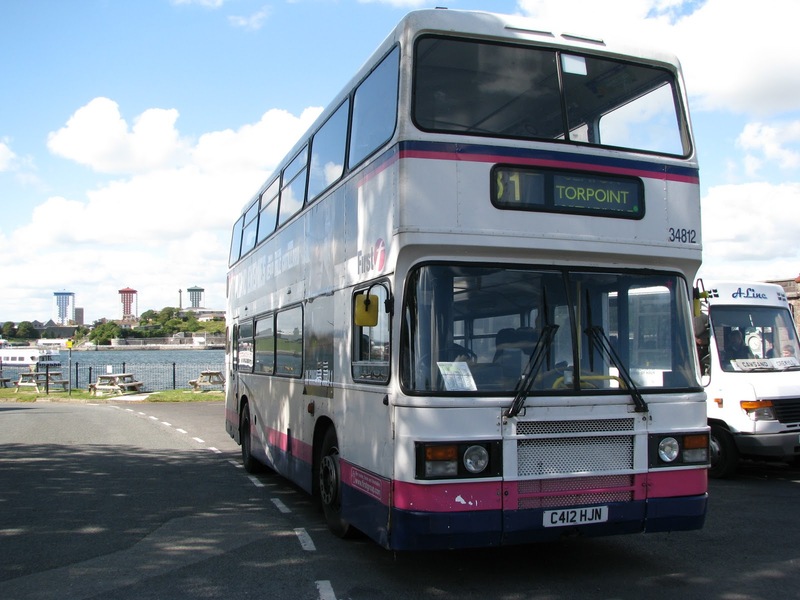 Of course the Tridents entered service in 2005, which saw off many of the VRs, leaving on LFJ 844/6/7W still running by the end of the year. K802 ORL joined the fleet in early 2006 and some great photos of her negotiating Hounster Hill can be seen. This itself is now from a bygone era. The old 80B used to run down here, but withdrawn in 2007. Buses did still work up the hill on school duties, though First then decided it was too dangerous, largely because the short 1 lane section leaving Millbrook is very tight for a Trident. You may also remember that C412 HJN failed to make it up the hill leaving Millbrook and pupils were forced to walk up the hill, leaving C412 light enough to power herself up the rest of the hill. K802 would have been the ideal bus for the service, with plenty of power, and being short enough to get round the corner with well, less trouble than the Tridents. K802 is seen after just arriving at the depot still retaining her old headlights and blind. These two photos show the 2 penultimate VRs, LFJ 844W of course being the last operating in South Devon. LFJ 847W is seen at Tregantle while 846 is seen conquering the very tight section around Anderton. This part of the route was withdrawn soon after being the Tridents were un-able to negotiate the tight corners. There was a limited services throughout 2006 where it was rostered that only Olympians, Varios, and the Dart would use this road, but of course inevitably Tridents did escape onto the certain duties and therefore the decision was made to route all services via Maker, when the 81C was set up in 2007. Well today from the top of Royal Parade I spotted K616 LAE about to go on service. Luckily enough I had some time before my 81C was due to whisk me home after a session of 11+ invigilating and therefore took the opportunity. I knew time was tight, so I did a light jog down to the stop where the driver could clearly see me approaching. He proceeded to then close the doors and check his mirrors, I thought oh well fair enough, I can't really blame him for that because it was my fault for not being prompt for the departure of the service. I therefore took and step back and was going to take a photo of the departure instead. Though interestingly when I produced the camera, he pulled back into the stop, and allowed me to board the service, apologising as I got on. This was quite an interesting move in that he felt threatened enough to pull back into the stop, in fear of getting in trouble. I feel he probably would have had a just case against me if I was going to do something like that, once he pulls off the stand he can totally ignore any waiting passengers, its no longer his responsibility as it could mean a dangerous manoeuvre to pick up the passenger wanting to board. Quite an interesting situation, not something I'd want to repeat, simply because it made me feel guilty to the effect that I'd held him to ransom with a photograph. Well anyway the offending photo is at the top, I wouldn't say the photo is clear enough to be able to identify the driver anyway, but I suppose it would have recorded the date and time along with the service and vehicle. Certainly interesting to see his reaction though, I wonder if other drivers would do the same? With thanks to Kameron Allan I can bring you these photos of Stagecoach Devon's brand new 60 plate Enviro 200s. Interestingly, bucking the recent trend of buying Enviros with Scania chassis', these are fitted on top of the more standard Alexander Dennis chassis. In total it is rumoured that there could be up to 36 joining the fleet in total, as to what they are replacing it is not entirely clear, though speculation says is could be some of the Volvo Olympians. Though they are drastically different sizes the capacity is fairly similar because of the extra standing capacity available on the Enviro 200. Of course the Dennis version is a lower quality, but they are much easier to run and the public of course will notice no real difference other than that of the slightly different seating layout. Certainly good to see SCD investing in the fleet even in these tough times. 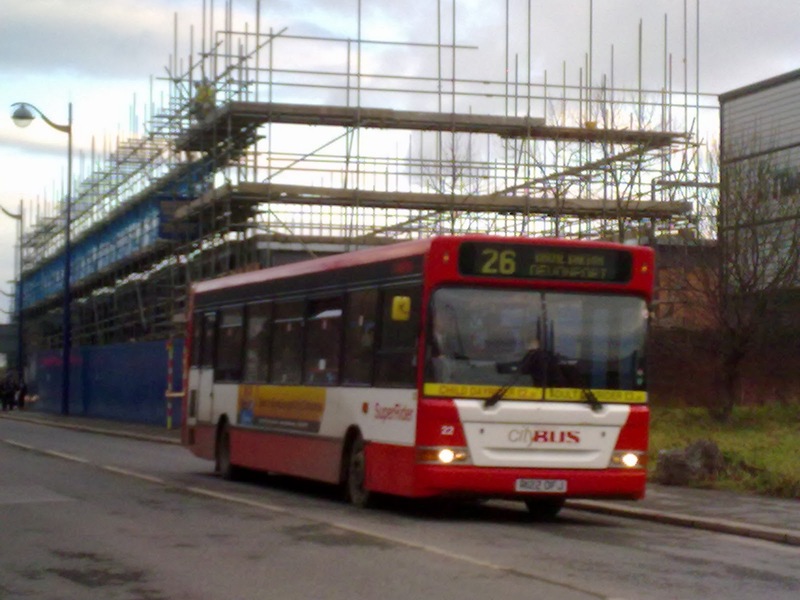 It has also been announced that Exeter may enjoy a 4th Park and Ride in the near future, so we shall look out for that! This again can bring me back to what I have said previously about Stagecoach possibly being a better bet for the company that should have taken over PCB, seeing as Exeter is still enjoying a really high quality level of service from their main operator. First Great Western have recently been doing many station improvements across the South West's network including installing the new 'Help Points', putting in new real time screens and announcement systems, and other general improvements to continue the great work FGW have recently been doing. The latest thing though seems to be the addition of new ticket barriers to currently un-barriered stations. The two stations that are currently receiving the treatment both carry a lot of traffic, these being Exeter Central and Truro. Both of these are quite obvious candidates. Truro receives a lot of people from both ends of the county, and also contains the branch line to Falmouth. Before now people walked through the ticket hall to exit. The doors were fairly small though and at peak times the area would become bottle necked with passengers, so the addition of gates to the sides of the platforms seems a sensible idea. Fare evading can also be a problem in this area because of certain un-manned stations. This gives the ticket inspectors more work to do and therefore not all passengers can been physically checked or issued with tickets in their journey and therefore this of course results in loss revenue for the TOC. Though there is also an exit from the Pumpkin Cafe that goes out onto the main road past the station. If this new system is to work surely this is going to have to be boarded up, or people will simply escape through there. Exeter Central often has extra staff on hand at the exit to the station to check the tickets, so people don't necessarily get away with fare dodging that easily, but of course the addition of the barriers here I'm sure will be greatly appreciated as people hurry down the flights of steps to the platforms. Though as Mr Rawlings pointed out, there is again a second exit from Exeter Central, so again something will have to be done here before the barriers can see full effect. Whether they can close the exit entirely is questionable, so we shall have to see what happens!